Choosing the Correct Brush for your Pet — "Making the world beautiful one pet at a time"
It is so important, in any thing you do, to choose the right tool for the job. This rings true, especially for caring for your dogs' skin and coat. Proper brushing stimulates hair growth, exfoliates dead skin cells, stimulates oil gland secretion, to keep skin soft snd supple, gets rid of shedding hair, as well as keeping the long coats matt and tangle free. Short and Smooth Coated Breeds ( Beagles, Dobermans, Pugs, Chihuahuas ) I especially love a KONG® Zoom Groom Brush a great grooming brush for long and short hair. Massages skin and stimulates capillaries to promote natural oil production for healthy skin and coats. Effective for all dogs and they love the way it feels. Collects loose hair like a magnet and leaves coat shiny and beautiful. Works great as a bathing aid too, helps scrubs away dirt and grime. All breeds can benefit from using this brush wet or dry and it give a mini massage while ridding your pet of shedding hair. You will get the most shedding hair out AFTER the pet is bathed and completely dry. Rub the Kong brush over your dog and watch the hair fall out. You can follow up with a bristle brush to lay the coat flat and add a shine. A de shedding or carding tool can be used but be very careful not to go over the same spot more than 5 times to avoid brush burn to the skin. You can also follow up with a very fine tooth comb or flea comb. 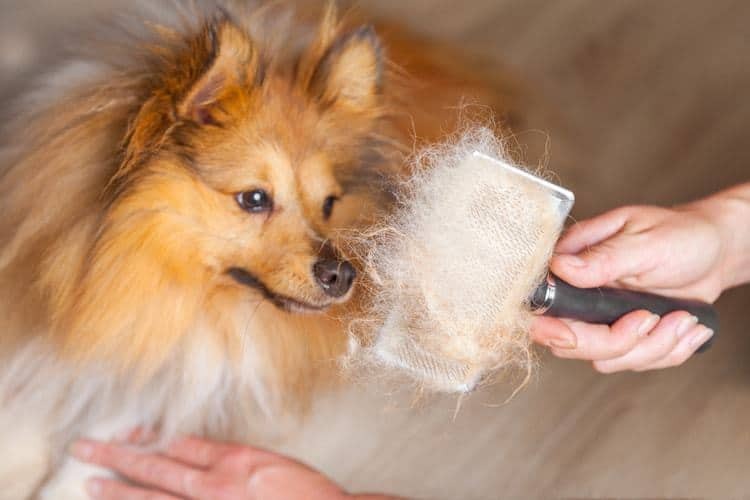 Double Coated Breeds ( Corgis, Siberians, Pomeranians, Golden Retrievers) Because these coats are usually thick and dense, I recommend a hard Slicker Brush. This is a stiff wire brush that can get through dense coats. Use these brushes to get through mats and tangles, and follow up with a wide tooth comb. Long Flowing/ Wavy/ Silky Coats ( Lhasas, Shih Tzus, Maltese, Yorkies, Havanese, ) A Pin Brush is recommended for these breeds , BUT...the coats need to be mat and tangle free for them to work. If your pet has matting or tangles, then I suggest a soft wire slicker brush to break the matting up. Then you would need to follow up with a Greyhound Type metal comb to make sure you got all the tangles out. It is very beneficial to use a fine mist coat spray to SLIGHTLY dampen the coat when you brush to help prevent static and breakage. If your pets have mats and they get wet, the mats will become larger and tighter. Cats.....a Soft Slicker Brush and Greyhound Comb work great on Longhair kitties. Smooth coated cats benefit from a Kong brush and bristle brush. Pay special attention to certain areas that are prone to "Friction Mats". These mats are caused where the pet's coat comes into contact with something else. Some common friction spots are, armpits, under the collar, behind ears, feet, rear end, where they sit. I am attaching a link to a video that instructs owners on the proper method of brushing called LINE BRUSHING. This method gets the coat brushed from the skin out. I have see many pets, over the years, who the owners swear they brush the dog, (I am sure they do) BUT the layer of coat against the skin is completely felted against the skin, even though the top layer is brushed. The only solution to a coat felting is shaving it off and starting over. This is just a basic overview of proper brushing techniques. Feel free to contact me if you have any specific questions regarding your pet. Older PostAre Your Pets Safe With Us?